Should taxpayers help parents pay for private schools? This month, Florida could adopt the nation's first statewide tuition voucher program. The Florida plan would give students at “failing” public schools state-funded “opportunity scholarships” that could be used to attend any school of their choice, including private religious schools. At least four other states are considering similar legislation. The constitutionality of using taxpayer money to send children to parochial schools was left unclear when the Supreme Court refused to hear a case challenging the voucher program in Milwaukee. 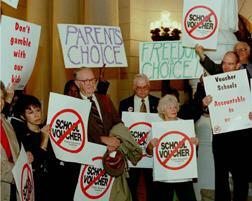 Opponents say vouchers siphon money from struggling public schools. Furthermore, they argue, there is no definitive proof that student performance has improved in districts with voucher programs. But public support for vouchers and other school-choice plans appears to be growing, especially among minorities.